I have used this Fold that Story site in various online collaborations and, well, you never know. That’s why it’s perfect for Networked Narratives. So, come join in. The way it works is that you only see the “fold” (what the other person wrote) just before yours. You can’t see where the story started or earlier folds. So, the story zigzags quite a bit. I’ll share out the entire thing when it is done (I have it set at 25 folds). Here is a visual tutorial I made to help newcomers write, fold, share and tell the story. 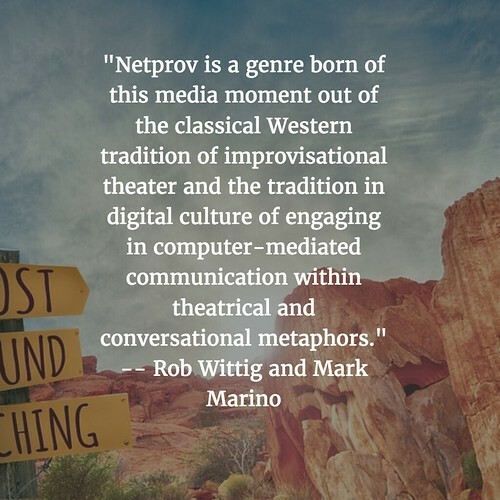 Rob and Mark, both college professors, say Netprov can and Netprov does, because the satire element forces the “actors” to be attuned to the why and what they are doing, and that often brings to the surface deeper cultural constructs. Rob also talked quite a bit about the “fake news” element of our media world, and how projects like Netprov can showcase the absurdity of the PR-spun alternative realities that politicians and media like to spin (as well as that lone person in their basement, pumping out fake news for clickbait profit). Bowling Green Massacre, anyone? (Maybe the new administration is pulling off some epic, large-scale Netprov on us all? I shoulda asked that question in the hangout). 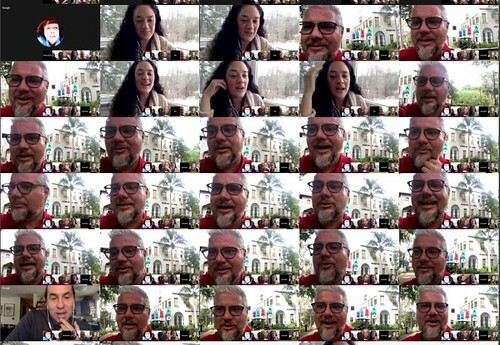 Terry Elliott has put the Hangout video into Vialogues for further study, and he invites you and us to listen and add comments. Oh, and he may have begun a little comment/margin/annotation Netprov there, too. All in the spirit! Get improvising! So, I am on another meander .. trying to parse out the possibilities of Twitter Bots as a means of digital writing. And wondering, is it? I don’t rightly know. Thus, the meander. I’m on this line of inquiry thanks to the Networked Narratives crew, and one of the paths revealed during the recent “studio tour” with Leonardo Flores, whose work with generative Twitter Bots sparked some interesting annotation discussions. Certainly, Twitter Bots — which are programmed to release writing or images or something from a data base at random or programmed times — are numerous (as I found when I started looking for them with new eyes) and funny and entertaining. 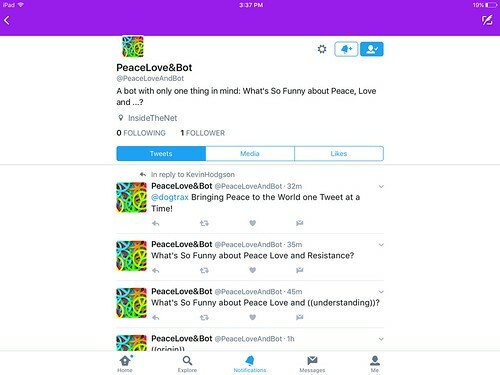 Some bots mesh together ideas from other sites, creating a hybrid tweet. Others are original material, parsed together in odd ways. Some bots take on personalities from history, using archived texts as source material. Others are like programmed memes, making political fun of something through satire and sarcasm. Some are stories, unfolding in small bits over time. Right now, I am following Mia Zamora and Alan Levine’s suggestion at Networked Narratives to “follow some bots” and see what happens over a few days time. 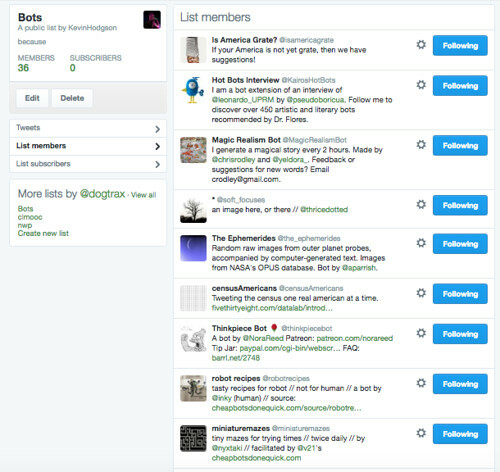 I created a Twitter List of various bots that I have found (and feel free to follow the list if you want or you can ask Flores’ HotBots Bot to recommend Bots to follow based on your question or theme), and find myself dipping into the narrative stream now and then. It’s not a great strategy because the bot tweets are all mixed up, like a book whose pages have been put into disorder. What I am wondering about in the larger picture, though, is this: can I make and launch my own Twitter Bot? Yesterday, I started working on a Twitter Bot to send into the NetNarr twitter stream and I think I can pull it off, but I have been struggling with what would I want that bot to say to the world? What database might it mine for words and ideas? What message? Is my act of making a bot share writing out to the world an act writing? More to come …. tomorrow, I will write about my bot experiment. Part of the “spine” of the Networked Narratives adventure is a series of “studio visits” with practitioners and others of digital media and digital storytelling. But these seem to likely happen during my teaching hours. Not so worry. 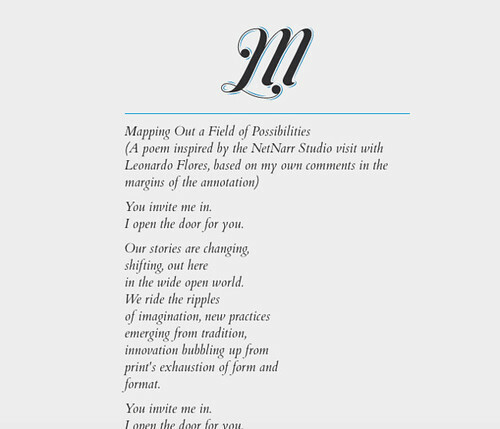 I am using Vialogues to annotate yesterday’s studio tour with Leonardo Flores, as the crew chats about digital poetry and electronic writing. 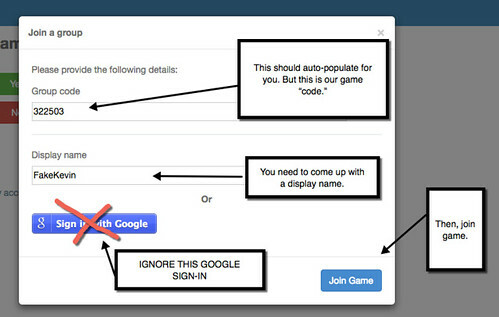 You can annotate the video, too. 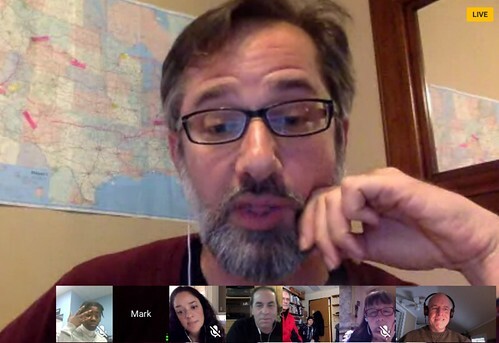 Just come over to Vialogues, log in and as you watch the Hangout, add your thoughts to the margins of the video. It’s all about the conversation. I made this for a Networked Narratives daily assignment. 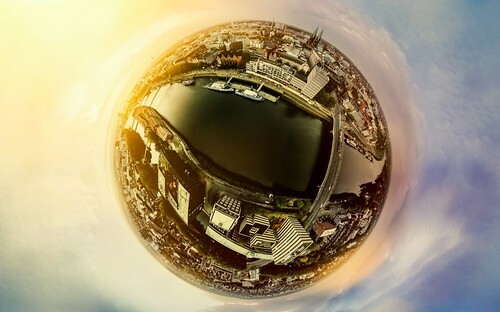 Google’s shift into transforming video stories with 360 degree perspectives dovetails nicely with the push into virtual reality storytelling, and some of the talk scattered around Networked Narratives (and more likely to come). This release — Pearl — tells the heart-warming story of a father and daughter, all set inside and near a car, and the viewer can move around the setting of this car as time passes on. What I find fascinating is how this kind of video/story experiment begins to push the agency of the storytelling to the viewer, who can move around the “car” here, or just keep the eyes focused outside the windows. The story unfolds, but where the lens is looking all depends on us. I think that is intriguing. And watch the Behind the Scenes video of the Making of Pearl. Part of the “assignment” this week for the Networked Narratives course is to document the four Elements, as part of a larger discussion about Digital Alchemy. As usual, I decided that the idea of eight images of the elements (four literal, four interpreted) wasn’t what I wanted to do. But I did wonder if I could write four short poems, based on the elements of earth, wind, fire and water. Using the app Legend, which animates text against a visual background, I got down to work, trying to hint at the elements but trying to write about something larger. I hoped the visual would connect to the element, as well as some key phrases. The constraints were length: Legend only allows a short amount of text, and the resulting animation is only six seconds. But I was happy with each of the poems, which I think mostly captured what I was trying to accomplish in terms of the elements as inspiration for writing. 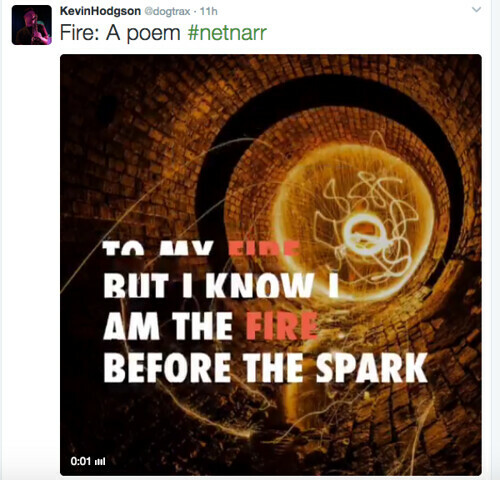 I posted each short poem on Twitter, via the #Netnarr hashtag, but then realized I really wanted them to be stitched together, so that all four poems of four elements became one digital composition. I turned to Animoto as the easiest way (I could have done it in iMovie) but also because I knew they had “elements” themes. The “air” theme seemed right, particularly when I found the “rain” song to go with it. 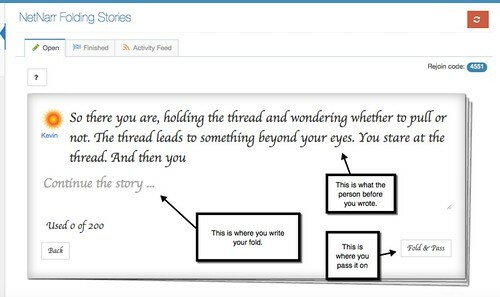 Networked Narratives is a hybrid course – part of a Keane University offering AND an open invitation to anyone. Come join the fun, with Mia Zamora and Alan Levine leading the way.